The astronomers in the UPV/EHU’s Planetary Science Group have published, on-line in the prestigious journal Nature Geoscience, a study of the atmospheric vortex of the south pole of Venus, a huge whirlwind the size of Europe. In the atmosphere there are two main cloud layers separated by a distance of 20km. The UPV/EHU astronomers have been closely monitoring the movement of the vortex on both levels, and have been able to confirm the erratic nature of this movement. “We knew it was a long-term vortex; we also knew that it changes shape every day. But we thought that the centres of the vortex at different altitudes formed only a single tube, but that is not so. Each centre goes its own way, yet the global structure of the atmospheric vortex does not disintegrate," explains Itziar Garate-Lopez, head researcher and member of the UPV/EHU's Planetary Science Group. In fact, the centres of rotation of the upper and lower vortex rarely coincide in their position with respect to the vertical, and as the researchers have published in their paper, “they form a constantly evolving permanent structure” on the surface of Venus. 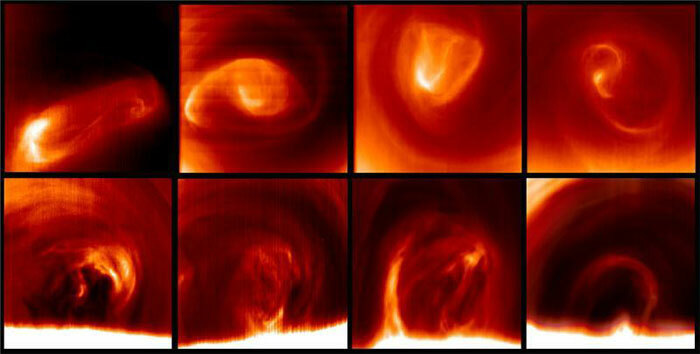 The permanence of the Venus vortices contrasts with the case of the Earth. “On the Earth there are seasonal effects and temperature differences between the continental zones and the oceans that create suitable conditions for the formation and dispersal of polar vortices. On Venus there are no oceans or seasons, and so the polar atmosphere behaves very differently,” says Garate-Lopez. The UPV/EHU group has been able to monitor the evolution of the south pole vortex thanks to one of the instruments on board the European Space Agency’s Venus Express spacecraft, which has been orbiting our neighbouring planet since April 2006. “The orbit of this craft is very elliptical: it gets very close to the North pole and South pole, yet the planet is observed from a greater distance, which allows a more global vision to be obtained. This is what we needed for our study, a more complete view of the vortex and at a lower speed, so that the instrument we used could capture the images we needed." Also needed was a more extended view offering a detailed view of the planet's south pole, whereas the north pole is observed from much shorter distances, which prevents it from being observed globally," explains Garate-Lopez. The UPV/EHU astronomers have been using the VIRTIS-M infrared camera on the Venus Express probe and have been analysing data obtained in the course of 169 earth days, and in particular, they have been studying in great detail the data on the 25 most representative orbits. Garate-Lopez explains that this is no straightforward task: “This camera doesn’t take individual photos like an ordinary camera, it divides the light into different wave lengths that enable various vertical layers of the planet’s atmosphere to be observed simultaneously. Besides, we have compared images separated by one-hour intervals and this has enabled us to monitor the speed at which the clouds move,” says Garate-Lopez. The UPV/EHU astronomers Agustín Sánchez-Lavega, director the Planetary Science Group, Ricardo Hueso and Itziar Garate-Lopez have been working in collaboration with experts from the Astrophysics Institute of Andalusia (CSIC-Spanish Scientific Research Council), the Astronomical Observatory of Lisbon (CAAUL), the Paris Observatory and the Institute of Space Astrophysics and Cosmic Physics in Rome.